Luke and I have been going through the classic books of Milne this school year. He has fallen in love with the world of Christopher Robin and often quotes moments from the books like "Tut tut, it looks like rain". I have always thought it was interesting that people use Pooh Bear for baby showers and first birthday parties. Disney has portrayed Pooh and a creature for infants, but A. 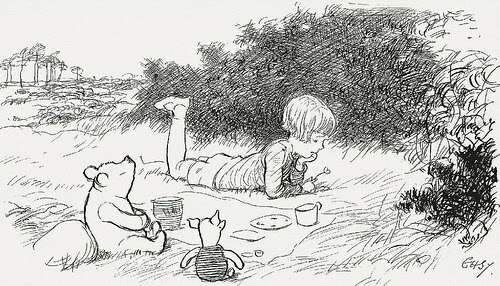 A. Milne, the creator of the Pooh character was writing for little boys. Between the ages of "When We Were Very Young" and "Now We Are Six". My youngest child is now 5. Such bittersweet moments I live in right now. I have spent the last 19 years with a toddler or two and now, all of a sudden, I don't have one at all. So when my nature-loving youngest son, who is so VERY much like Christopher Robin in the original Milne books, said that he wanted a Pooh birthday party, I didn't hesitate. I wrote the invitations in Milne's classic writing style and tied them with a 'hunny' stick to give the invited a touch of anticipated sweetness. When the children arrived at the party, I had a bounce house set up in the school room due to rain. I couldn't get a single picture of this, as it filled the room completely. The door barely opened. But there was much bouncing and laughing and 'tigger-style' fun before lunch! Then came a Smackeral of Something. The tree above the table was twisted packaging paper with cardstock trees and sweet little feather-winged bees on a large paper lantern. How could I miss an opportunity to decorate with two of my vintage copies of The World of Pooh and Now We Are Six (which I changed to Five, for the occasion). The table was bedecked with little signs, such as you would see in the Hundred Acre Wood. They are just simple floral foam covered in moss with craft stick signs stuck in them, but man, were they a cute addition! The menu was pretty simple. All of Luke's favorite foods. First, we had 'Pin the Tail on Eeyore'. I drew this Eeyore on poster board and then cut tails out of cardstock. I used yellow chevron washi tape to continue the theme. From what I can tell, most of these kids could see. Lol! But they had fun. Next up, we took an 'adventur' to the creek by our house and played Pooh Sticks. This turned out to be the most fun ever and we stayed there for about 45 minutes, throwing sticks off one side of the bridge and running to the other side and waiting to see who wins. Sometimes the sticks sunk right to the bottom of the creek, sometimes the sticks just disappeared. But there was a lot of fun had for all these 4 and 5 year olds. After our 'adventur', we came home and watched the classic Winnie the Pooh movie. I popped popcorn and we had caramel corn, honeycomb cereal, and birthday Teddy-Grahams to put in our popcorn treat as we watched the movie. Then was cake and present time. This amazing blueberry muffing cake recipe can be found here. Action shot - his sweet face. We started singing him Happy Birthday and he looks over at me. He has always been the most easy to train up in gratitude. Not that my other kids are not polite, they are! But Luke has a natural gratitude that goes beyond anything I have done, down to the core of him. He is just naturally moved by acts of love. So I bring the cake down to him, we are all singing Happy Birthday, and he looks up at me. Then he just has to give me a hug. No words, just a big hug. The party moves on after that, but I am glad my husband caught it, because.... oh that sweet, sweet face! The gift bags were super simple. Just twig pencils, 'hunny' sticks, a carrot chocolate, and a 'hunny' flavored sugar crystal stick.All tucked into an adorable little brown paper bag. Very simple, but very loved. Luke has colored with his pencils all week long. And that's all folks! 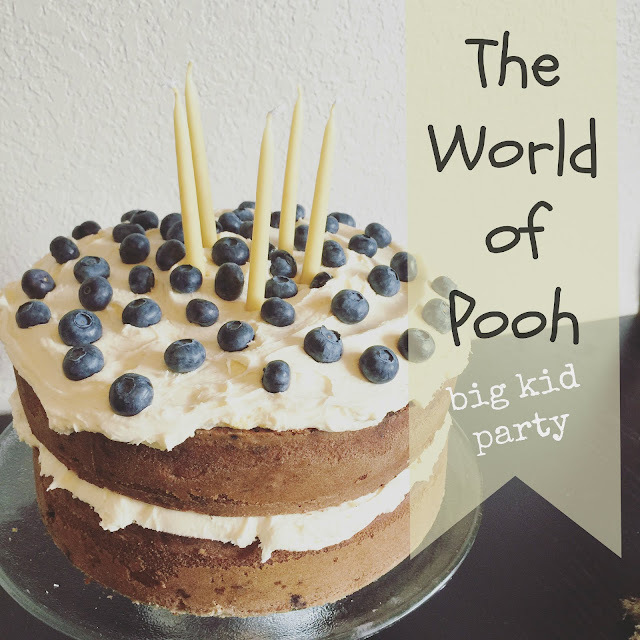 A big kid, Winnie the Pooh birthday party! Complete with the games that Christopher Robin himself would have loved. It was an absolutely adorable party! That picture of his hug is so sweet. It was a beautiful party, good job!